Bu-But I want to share my thoughts on a wider network! So, you can only think in these places in China? I usually just outsource my thinking to India. As opposed to foreign thinking, which this was sign was made for. Local Thinking here, International thinking is down the hall. Think local, not national, local. 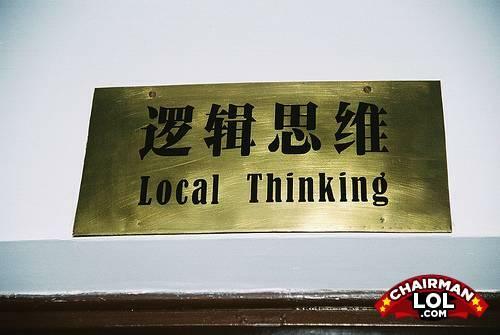 so, there is such thing as the mythical "local thinking" room in china, just like in their legends and folktales! The think tank thinks here.